Those were my kind of rules! And you never know, I could very well have wound up with a Project In Progress for 2012. So I signed up and as it turns out, I did have a PIP! This Block of the Month was a thorn in my side from the get-go, and I never thought I would finish it this year, but I did! Thanks to Mr. 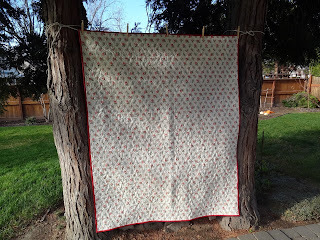 Squash who acquired some clothesline rope for me, I was able to display the quilt between our Junipers and use my vintage clothespins! 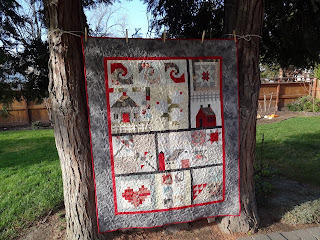 I quilted it using Quilter's Dream Wool batting which I just love for showing off the quilting - plus it washes and dries well and is oh, so cozy! I'm happy to finally put this one to bed and check off my PIP list! Many thanks to Stephanie for hosting a fun challenge! I am camera challenged around our house. For some reason the lighting isn't all that great - we have a lot of competition with our picture windows and very wide eaves. But I decided to show you some of our holiday decorations. 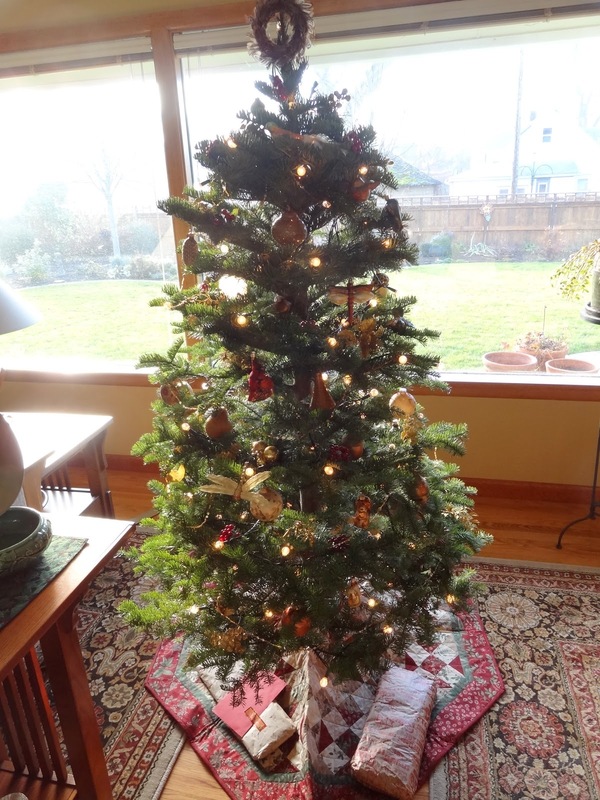 We got a smallish tree this year and I decided to use my "nature theme" this Christmas. I've been collecting nature-related decorations for a few years now and actually had enough for the entire tree this year! 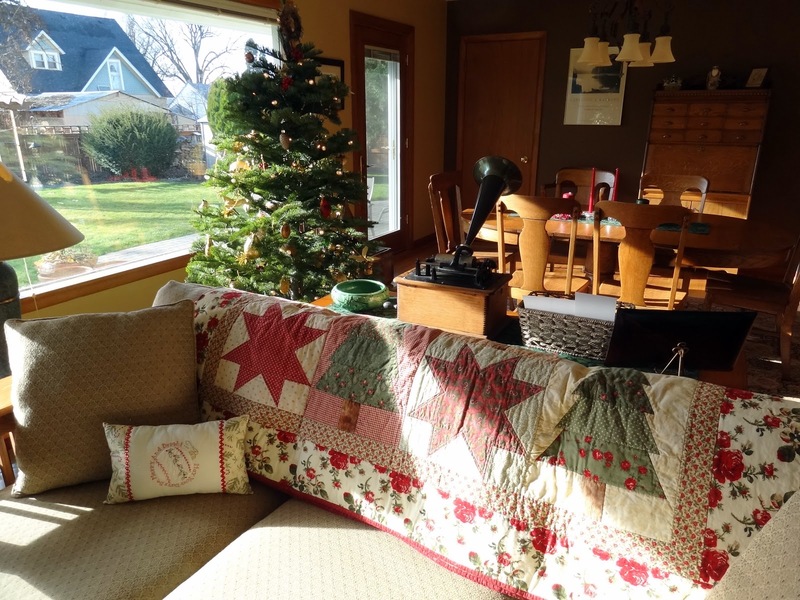 Of course what would Christmas be without a holiday quilt in the living room? This is one of my very early quilts. My friend Carrie over at A Passion for Applique made me that darling little Christmas pillow one year. Here is my entry way quilt rack. 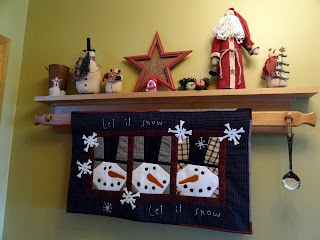 I made a backing for this table topper so it can be left up even after Christmas. Who knows if we'll get any snow - it's been a very warm fall so far. 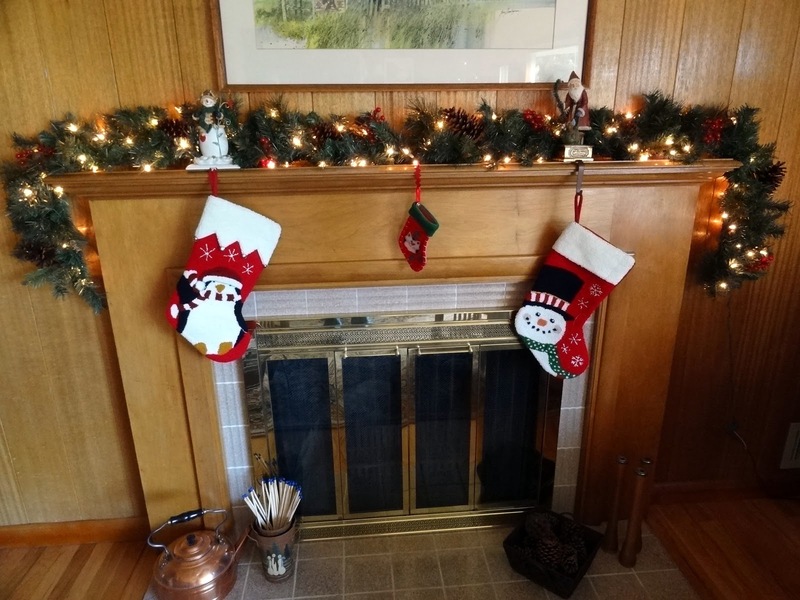 Here is the fireplace. There is a stocking for both Mr. Squash and I and of course a little one for Miss Sophie! Mr. Squash's sister got us this beautiful, hand carved and painted St. Nicolas on a trip to St. Petersburg, Russia, one year. 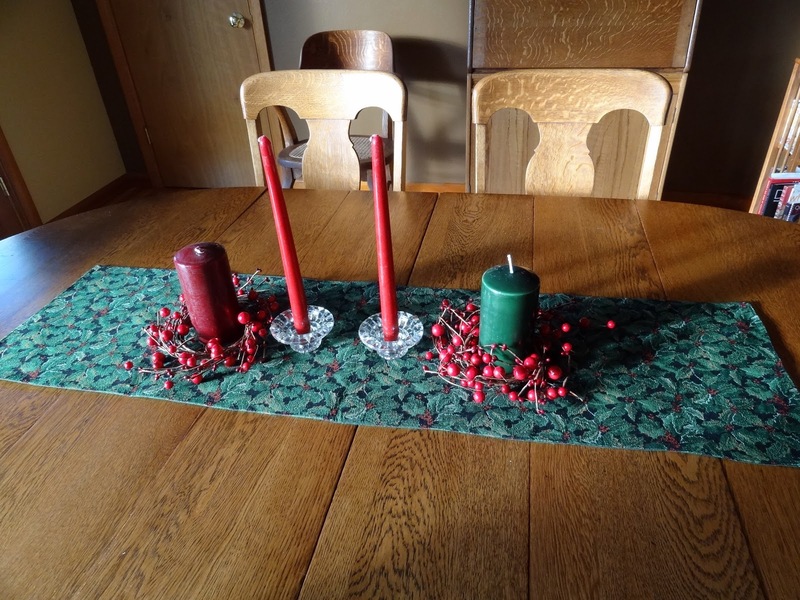 Very simple table decorations. 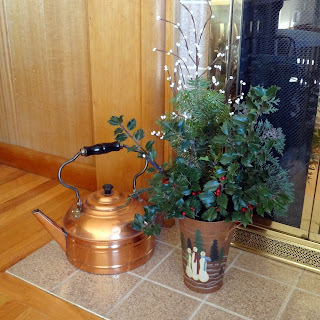 I'll add some fresh fir from the yard for dinner on Christmas Day! Kaaren over at the Painted Quilt has made some gorgeous fresh arrangements for her house. She gave me the inspiration to try some of my own. I haven't got much talent for this, but I'll keep trying! 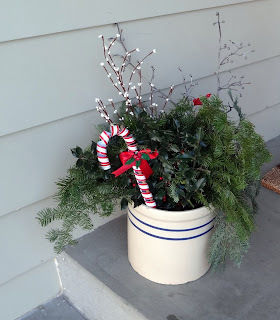 I put together this one for the front porch. Both are made of clippings from around the yard and from our Christmas tree. I hope everyone is enjoying the season so far, I know we are! Fabulous Finish. Pip Pip Hooray! 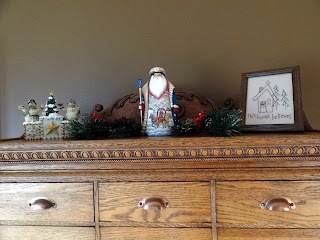 I love all of the holiday vignettes. The crock by the front door is so inviting. Enjoy the season. Well done for finishing the quilt. I hate things hanging over me too. Beautiful decorations. I finally have my room back, so I can finish decorating now. Doesn't it feel great to have that PIP finished? And it looks good - your quilting is super nice. 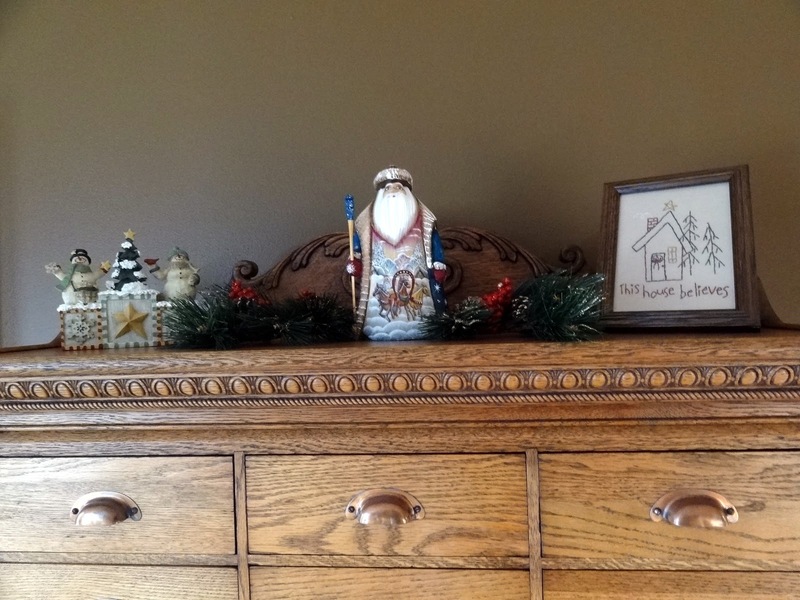 Also love all of your decorations and I would like to have a few pieces of your furniture! I love your fresh arrangements. They look so...FRESH and Christmas-y! *wink* Your house looks very invinting. Great job, Candace! And your PIP? It's beautiful. Doesn't it feel great to be able to strike another one off the list? Your home is decorated beautifully. When I cut something and put it in a jar, it looks like I cut something and plumped it in a jar. Nothing natural looking about it at all and certainly not artistic! You did well! Candace, your quilting looks wonderful! The house looks so festive with all your decor. Hang in there with the greenery...it sometimes just has a mind of it's own. But, the ones you made look great. Congrats on your BOM finish! And your outdoor clothespin display space is a good spin on a regular clothesline :) I have only used wool batting once and the directions said not to dry it in the dryer--does the brand you used allow machine drying? Love all your Christmas quilts and decorations--the porch one is lovely! Congratulations obn the finish! The quilt looks very nice. 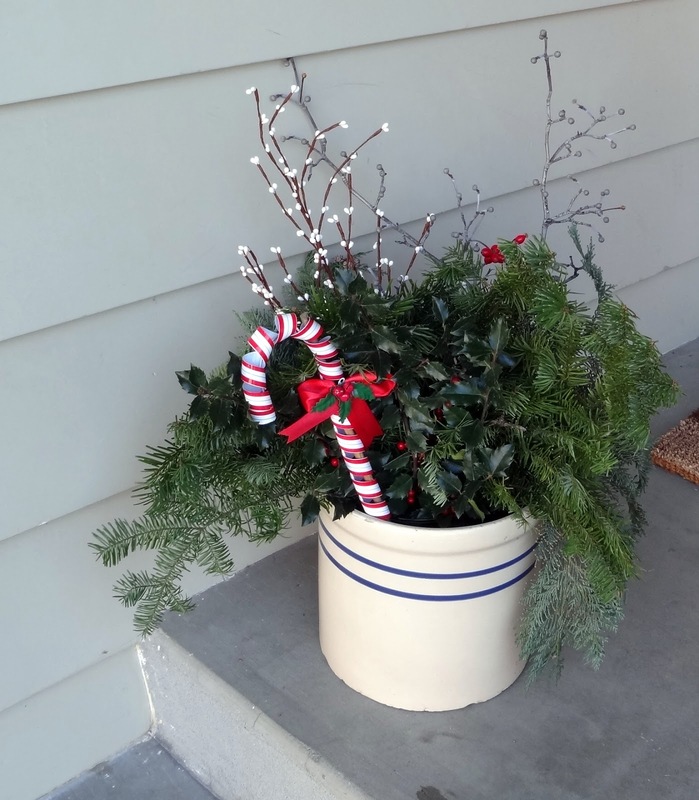 I like your Christmas decorations and the green arrangements. 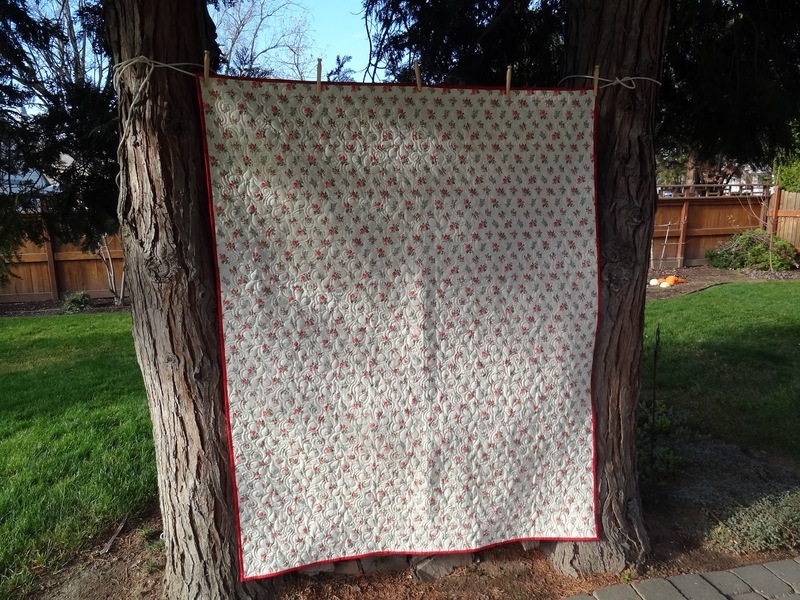 It is very satisfying to finish a project especially the naughty ones ;) your quilt turned out beautiful with warm colors! I love your Christmas celebrations! They are gorgeous! Congrats on a PIP being finished. Your decorations are all beautiful. I think you did a great job with the greenery. Good to see the quilts of the season warming your home. Happy holidays!